In 1938, as America was reeling from the Great Depression, a stocky, dung-colored, knobby-kneed racehorse named Seabiscuit captured the nation's attention. Columnist Walter Winchell named him one of the year's top ten newsmakers, along with Franklin Delano Roosevelt and Adolf Hitler. Meanwhile, "the Biscuit's" equine image sold everything from ladies' hats to oranges to dry cleaning services. 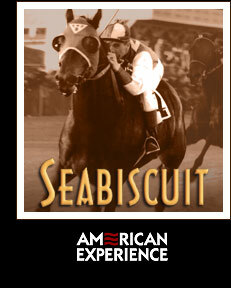 An American Experience documentary, "Seabiscuit," tells the story of the unlikely champion who became America's hero and of the men who nurtured his potential and drove him to superstardom. Weaving thrilling archival footage of Seabiscuit's major races with commentary by those who knew his owner, trainer and jockeys, the one-hour documentary by producer Stephen Ives (The West, Lindbergh) animates Laura Hillenbrand's best-selling book, Seabiscuit: An American Legend. Scott Glenn narrates. "He would have been a superstar in any era, but he came along at a time when America was desperate for inspiring heroes," says Laura Hillenbrand. One sportswriter declared that Americans had come down with "Seabiscuit-itus." While the story of Seabiscuit and his jockeys is primarily one of triumph over hardscrabble adversity, it also illuminates the national mood as the country struggled through the economic uncertainty of the 1930s. Seabiscuit "came along in the worst years of the Depression. Americans... wanted a hero that came from the wrong side of the tracks, that was beat-up like they were," says Hillenbrand. "For a brief moment in America, a little brown racehorse wasn't just a little brown racehorse. He was the proxy for the nation." Underwriters: Alfred P. Sloan Foundation, Liberty Mutual, The Scotts Company, Public Television Viewers, PBS and Corporation for Public Broadcasting. Producer: WGBH Boston. Executive producer: Margaret Drain. Producers: Stephen Ives and Eve Morgenstern. Director: Stephen Ives. Writer: Michelle Ferrari. Associate producer: Anne Tate. Cinematography: Buddy Squires, Allan Palmer, Peter Nelson and Allen Moore. Music: Joel Goodman. Format: CC STEREO DVI.